Vacation rental house. 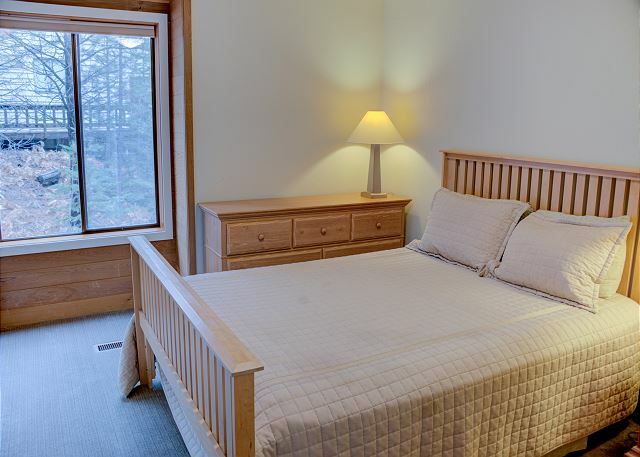 Sleeps 12, 6 bedrooms, 3 bathrooms. Dogs allowed. 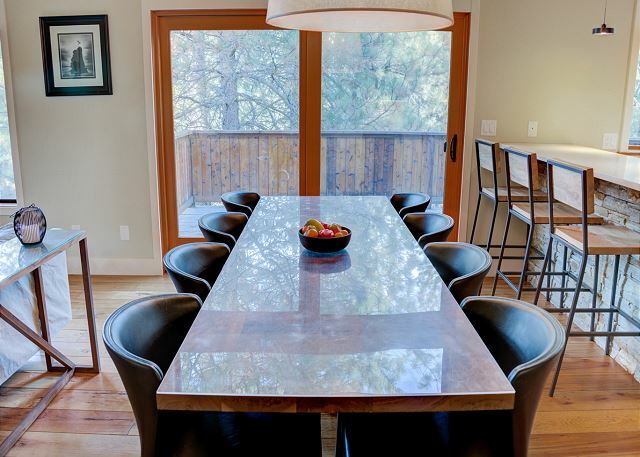 This light and spacious, contemporary vacation home has a newly remodeled kitchen, bathrooms and living room all add up to 3,110 sq. 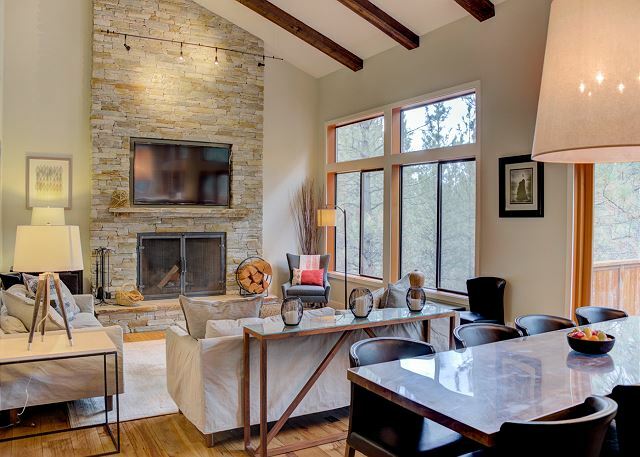 feet that is ideal for your large golf group or family gathering at Black Butte Ranch. This home provides both a living room for the adults and a family room for the kids' movies and games. The spacious kitchen, dining room with lots of seating, and expansive deck with a gas barbeque, add to the appeal for large groups. 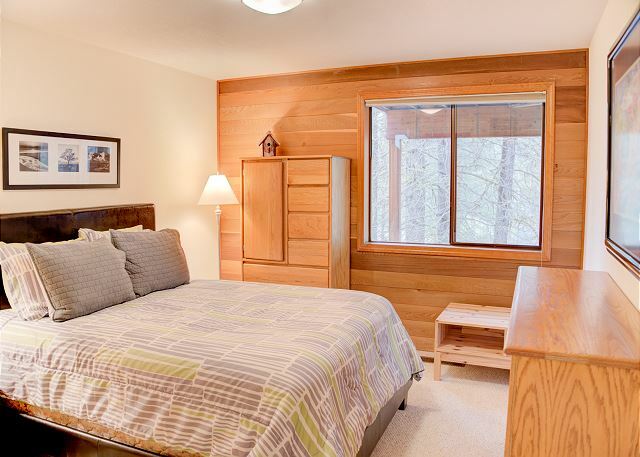 Six spacious bedrooms provide everyone comfort and separation for your vacation. Keep your recreation equipment and bikes under cover in the double garage. Beds consist of a king suite on the main level with bath, queen and twins on the main level with bath in the hallway. Queen ,queen and bunks on the lower level that share a bathroom in the hallway. Air conditioning and broadband wireless internet, plus three televisions and DVD players, give you the comfort of home. This home sits on a hill and gives you a tree-top feel. A large rear deck overlooks large Ponderosa Pine trees and you are within a short walk to one of the 5 pools on the resort. You can bike to anywhere on the Ranch easily as a bike path runs in front of the home. 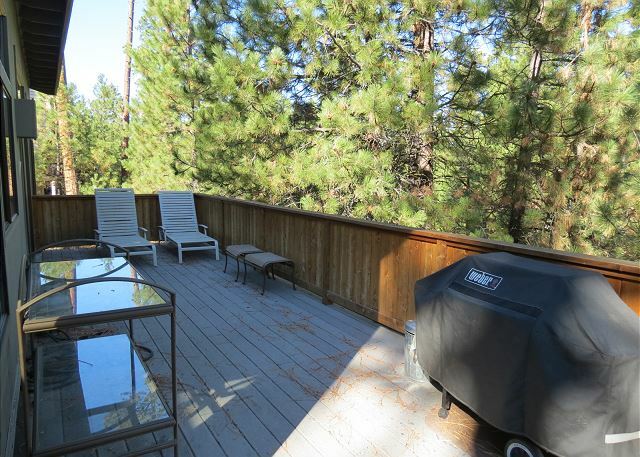 Don't leave your dog behind, he'll love the miles of trails at Black Butte Ranch and will love sharing this special home with you! Everything was great. We were surprised to see firewood was also provided. Happy to hear you enjoyed the home and your stay. Thank you! This home was perfect for our family including our kids and grandkids. 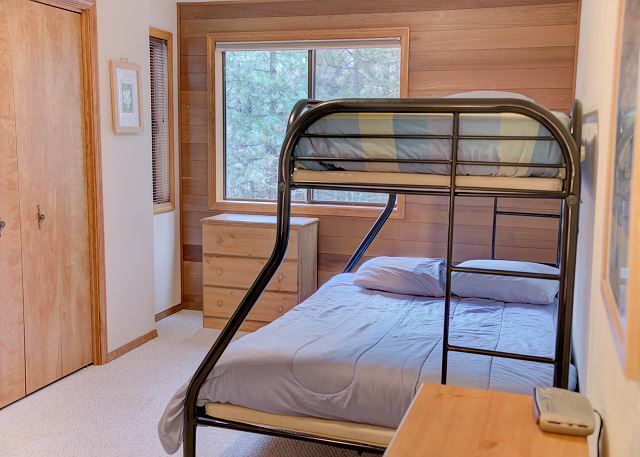 We’ve rented several homes over the years at Black Butte, but as our family has grown we neede more bedrooms and chose this one. The kitchen was great, we ate almost all our meals at home. Black Butte was wonderful, we enjoyed almost all the tanch’s fun activities. The towns of Sisters and Bend added to our vacation. Definitely tents this home again. Very happy to hear your family enjoyed the home! Thank you for booking with Howells. We hope to see you and your family again next year. While the house was lovely, up-to-date and clean. It definitely could use another bathroom but understand nothing can be done about that. Even so, we may rent it again and could recommend it as long as the issues addressed in the next paragraph are addressed. We have rented from Howell's for many years for a large group. We cook most of our meals at home. I have yet to rent a house that had a well equipped kitchen. In fact, most are enormously frustrating because they are not nearly completely stocked, from hangers and napkins (paper or cloth), to pots, pans and serving dishes. Invariably, we end up calling Howell's to bring something, and the staff is always prompt. However, I would expect that someone would make sure everything was ready for the number of guests expected. This trip, the following were delivered: extra pans and a large pot (which couldn't be used because they had enamel coating, additional place settings for eight, about a dozen wash cloths, a pad of paper and pen. There were no instructions for use of the stove, which was challenging. Several fixtures need replacement bulbs (ceiling in one of the downstairs bedrooms, one light in the only bathroom downstairs). There were four paper napkins and no cloth napkins. Using paper towels at the dinner table is not what I would expect to do at any home I rent. Given the amount of money we spend on the rentals, I believe everything, other than food items, should be in place. There is a place... And this is it! Adore this modern, spacious home. Clean. Great appliances. Lot's of attention to detail in décor and finishes. The room in this place goes on and on. Hawks Beard road and the bike path below you from the deck can be a bit distracting, but you work through it. Parking is a tight, Tetris effort and we ended up parking some vehicles down behind the Welcome Center area. Still, the home more than makes up for these minor inconveniences. We had several families stay for a long weekend. The main floor is very nicely remodeled and accommodated our family well. 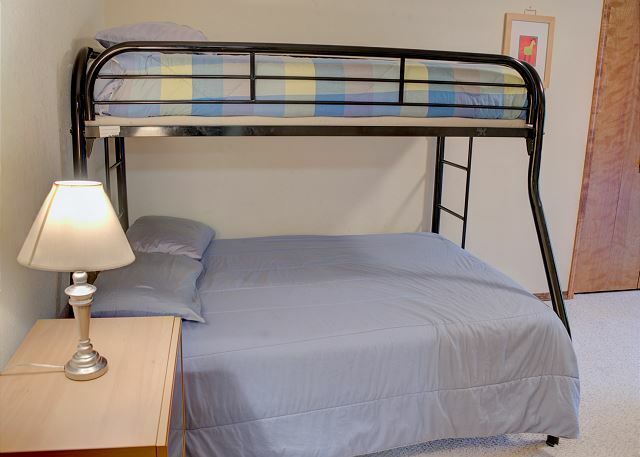 The lower floor offered lots of additional sleeping options. The BBQ and deck needed cleaning upon our arrival. The stay was excellent. We lost our daughter in May to a homicide and this was our first Christmas without her. We knew we needed to do something different and my two sister and their families all converged at BB to make the best of the holiday with our our Al Gal. We had a wonderful holiday and the house was clean, comfortable and well equipped to help make our stay a pleasant one. We had dinner at the table, played games in front of the fireplace and walked the lovely trails. Thank you for a very good time. 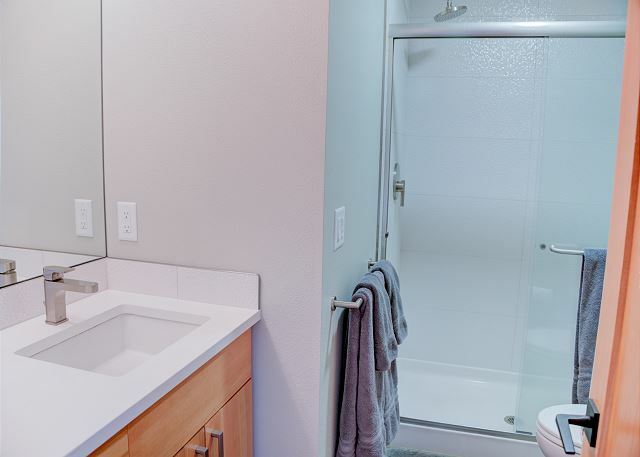 The home was more spacious and better appointed than the photographs suggested. It was a perfect home for our children and grandchildren. Our family of 12 had a wonderful experience in this beautiful, newly remodeled home. We all stayed in the same house 3 years ago and so appreciated the new surroundings. Our visit was great. The house, GH 254 was perfect for our needs. It was comfortable and fully stocked with towels, sheets, dishes,etc. we loved it all. Great house with many amenities and space for us all.